360° VR panorama from the trail around Alchak, near Sudak, Crimea. Cape Alchak (Мыс Алчак; Mis Alchak), also known as Mount Alchak (Гора Алчак; Goda Alchak) is a small mountain located to the south-east of Sudak. Its name comes from Crimean Tartar and means ‘low’, a suitable name with the mountain’s peak being 152 metres above sea level. Alchak is only 1 km in length and 600 m wide. In 1988 the area was declared as a nature reserve in order to preserve the valuable flora and geology of the mountain. A reasonably well kept path runs round the edge of the cape. Fishing from the rocks of Alchak is a popular pastime, in this image several fishermen can be seen. Also visible is the Devil’s Bridge (Чертов мостик; Chertov Mostik), a small wooden bridge that crosses a shallow but steep precipice. The name comes not from the current bridge, but rather the previous bridge, which consisted of an iron wire. 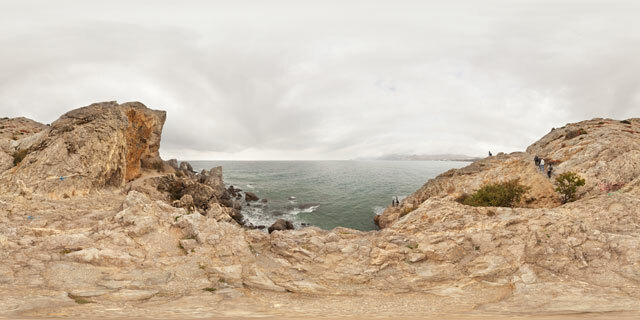 360° VR panorama looking out over the valley from Funa Fortress in Crimea. The valley below is filled with trees in their autumn colours. From the viewpoint you can see the village of Lavanda to the south-west, Luchyste village to the south-east, and the city of Alushta can just be glimpsed in the distance. Nearby are part of the ruins of Funa Fortress. Funa Fortress was a medieval Feodorite fortress located near the foot of South Demerdzhi mountain. The fortress was built in 1423, but later destroyed by the Ottomans in 1475. Today only ruins of the fortress remain. 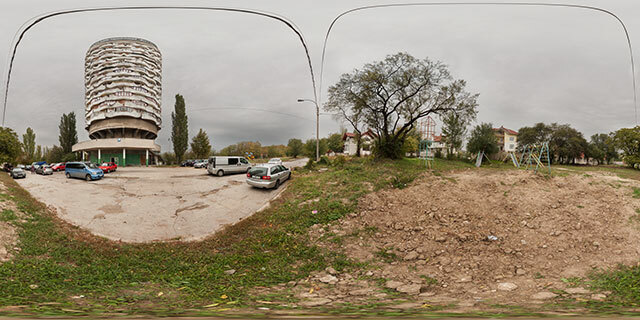 360° VR panorama by the Romashka Tower in the Centru sector of Chișinău, Moldova. The tower is known for it’s unusual architecture, designed by Oleg Vronsky. Construction of the project started in 1978, but stopped soon after. Originally designed as hotel / leisure facilities, the project was completed in 1984 with a change in use to housing. The building’s name, ‘Romashka’ («Ромашка»), means a camomile flower. It is also known as ‘Stone Flower’ (‘Floare de Piatra’) and ‘Corn Cob’ («кукурузный початок») as it resembles a camomile flower or a corn cob in some aspects. The nearby soviet era playground is abandoned, but a new one has been built on the land just to the south of the building. The area in front of the building is used for parking. The adjoining road to the south-west is blocked off. The building has 22 floors, plus an additional section on top, which offers excellent views over the local area. 360° VR panorama in the garden of the Cathedral of Saints Peter and Paul, Kamyanets-Podilsky. The Roman Catholic Cathedral is a popular tourist attraction, and is one of the seven wonders of Kamyanets-Podilsky. A church was originally established here in 1375, though the current building dates from the 17th Century. From 1672 – 1699 the building was converted to a Mosque, during the Ottoman rule of Kamyanets Podilsky. The Ottomans added a minaret to the building, which was kept after the Ottomans left. A statue of the Virgin Mary was added to the top of the minaret in 1756. In this panorama you can see the statue of Pope John Paul II in the garden. The statue was unveiled in June 2007. 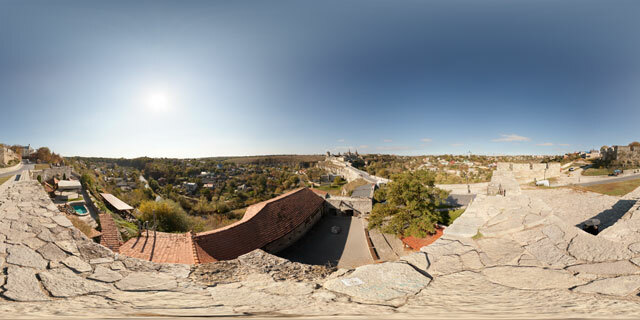 360° VR panorama from the Armenian Bastion in Kamyanets-Podilsky, Ukraine. The Bastion is located at the eastern end of the Turkish bridge, which leads to the castle. The city is located around an area where the Smotrych River has formed a sharp loop, acting like a natural moat. Previously the capital of the historic region of Podolia, Kamyanets-Podilsky (Кам’янець-Подільський) is located around a strategic transport crossroad, and has been subject to numerous attacks over its history. During its history, Kamyanets-Podilsky has been ruled by the Grand Duchy of Lithuania, the Polish-Lithuanian Commonwealth, the Ottomon Empire, and the Russian Empire. Historically there were four main ethnic groups that lived in the city – Poles, Ukranians, Armenians, and Jews. Each group has left their mark on the city, with a variety of architectural attractions for visitors to see. 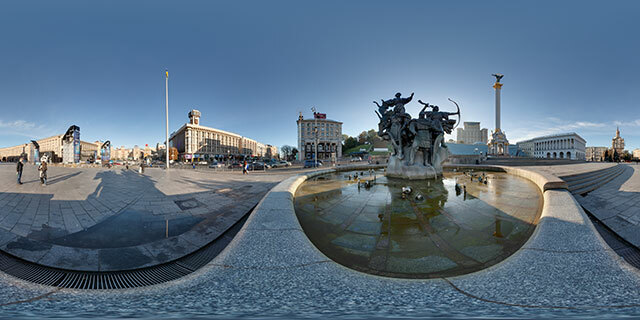 360° VR panorama next to the Founders monument fountain in Independence Square, Kyiv. The monument depicts the legendary founders of Kyiv – brothers Kyi (Кий), Schek (Щек), Horeb (Хорив), and their sister Lybid (Либідь). It was built as part of an overhaul of the square in 2001. To the right and behind is a tall column, also added as part of the rennovation, celebrating the 10th year of Ukraine’s Independence. The column is topped with a sculpture of a Berehynia, a female spirit in Slavic mythology. Notable buildings nearby are the Kiev Conservatory (Консерваторія), with its white columns, to the south; the Central Post Office (Головпоштамт), to the west; and the House of Trade Unions (Будинок спілок Федерації професійних спілок України), to the north-west. 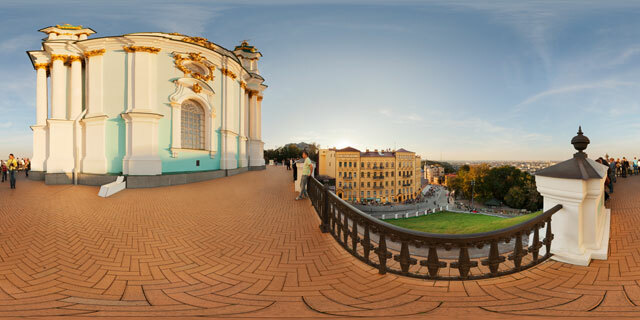 360° VR panorama by St Andrew’s Church (Андріївська церква; Andriyivs’ka tserkva) in Kiev, Ukraine. The Church is built on a hill, overlooking the Podil neighbourhood below. It is held that St. Andrew visited this area in the 1st Century AD and prophesied that it would become a great city. The Church is built on the spot where St. Andrew is said to have erected a cross. There have been numerous churches built in this location over time. The current building dates from 1754 and was designed by Italian architect Bartolomeo Rastrelli. The roof was badly damaged in a storm in 1815, and was repaired, with the cupolas being replaced in 1825. In 1978 the cupolas on the roof were restored to their original condition based on the original drawings of the architect Bartolomeo Rastrelli. The street that leads up to St Andrew’s Church is known as Andriyivs’ki descent, and is a popular shopping street for tourists. Traders line the sides of the steep street selling all types of souvenirs. 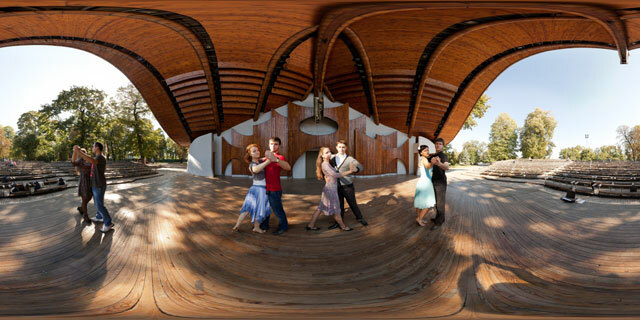 360° VR panorama of Renaissance Ballroom Dance club practicing on the Summer Theatre stage in Mariinskiy park, Kiev. 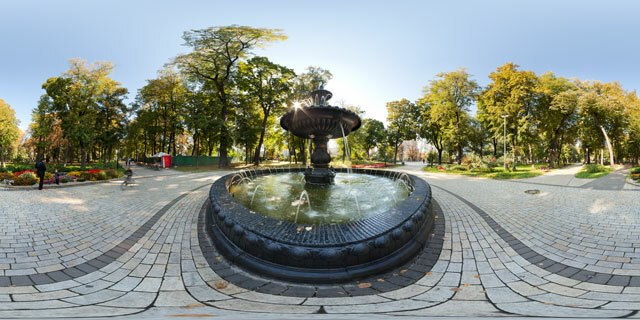 360° VR panorama by the Termen Fountain (Фонтан Термена) in Mariinsky Park, Kiev. The fountain is one of six produced by the Termena factory around 1900. The fountains were placed at different locations in Kiev and offered a practical use as a source of clean water, as well as being for ornamental purposes. Mariinsky park (Маріїнський парк) was founded in 1847, and is located near the central entrance to Mariinsky Palace. Today it is a popular green area for people to walk and relax. 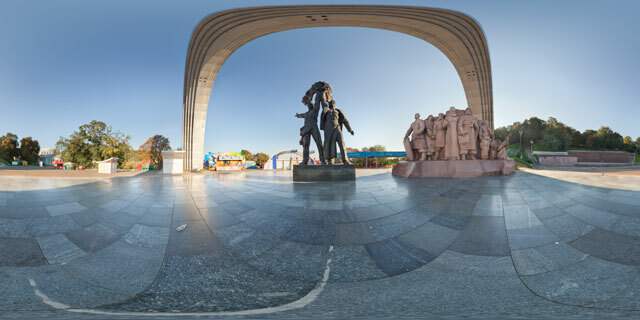 360° VR panorama under the Friendship Arch in Khreschatyk Park, Kiev. The Friendship Arch (Арка Дружби Народів) is dedicated to the friendship of Ukraine and Russia. Construction work started in 1978, and the arch opened on November 7th 1982, commemorating the 60th Anniversary of the USSR and the 1500th Anniversary of Kiev. The arch was devised by sculptor A. Skoblikov and architects I. Ivanov, S.M. Mirgorodskii and K. Sidorov. Constructed from titanium alloy, the arch spans a diameter of 50 metres. Underneath the arch are two smaller monuments. Centred under the arch is a 6.2 metre high bronze statue depicting Russian and Ukrainian workers holding up the Soviet Order of Friendship of Peoples. To the right (south-east) of this is a granite stele depicting the Pereyaslav Council of 1654 where the Ukrainian Cossacks pledged allegiance to the Russian Tsar. At the centre of the stele are depicted Cossack Hetman Bogdan Khmelnitsky and the Russian ambassador Vasiliy Buturlin. Behind the Friendship Arch are a number of fairground-style attractions, such as a bumper cars arena. Further behind these are a viewpoint area that provides good views across the Dnipro river. In the distance to the south-west can be seen the Ukrainian House, which was opened as the Lenin Museum at the same time as the Friendship Arch.